It’s pretty hard not to love San Sebastien in September. The weather is nice, the people are beautiful and the food amazing. 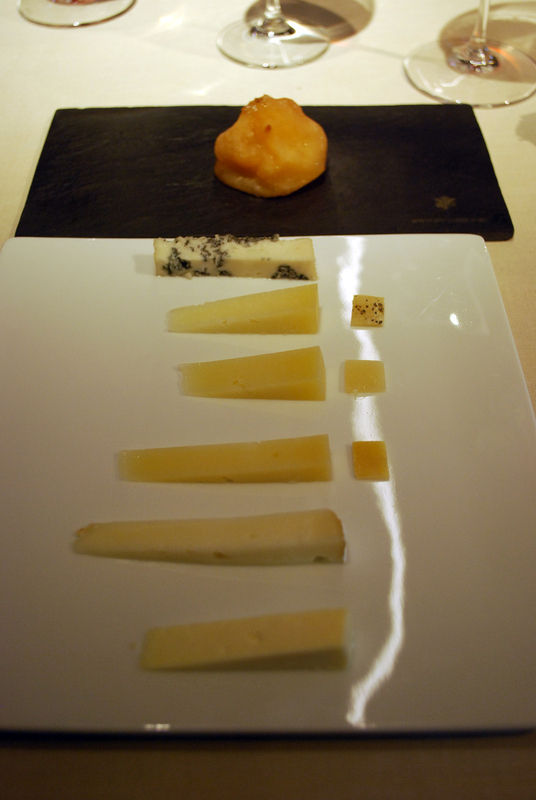 Even after a late night consuming beer and tapas in the old town I was in a good mood the next morning during the 20min taxi trip to restaurant Mugaritz. 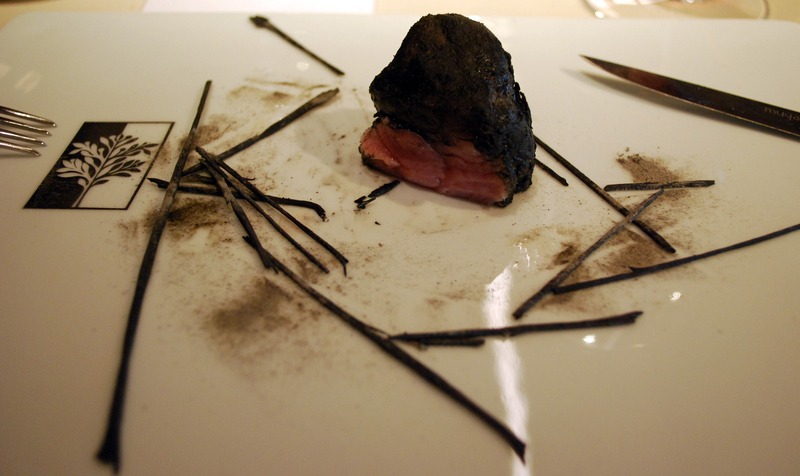 Mugaritz is rated the 5th best restaurant in the world according to san pelligrino’s top 50 restaurants. T tells me they were ranked 4th, and the one place drop may be the result of a fire which destroyed the kitchen earlier this year. In the taxi I discussed with J & T how the San Pellegrino’s 5th best restaurant in the world can have only 2 Michelin stars. 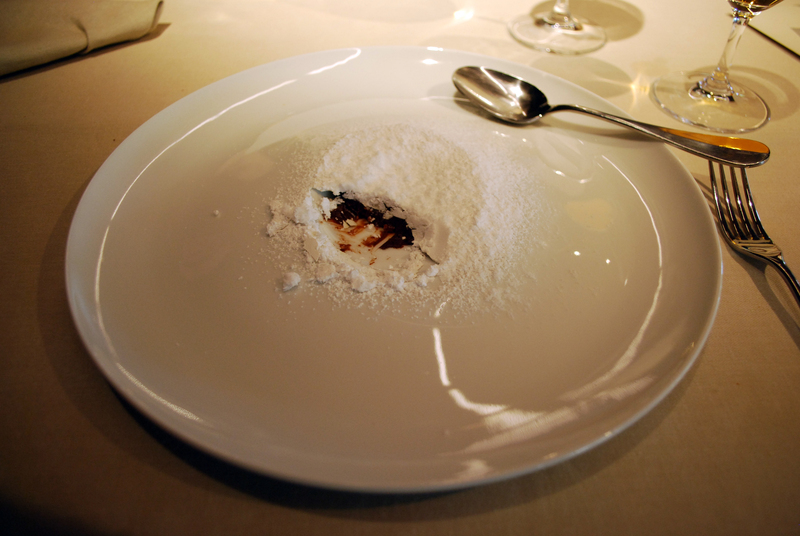 Furthermore how the San Pellegrino’s 11th best restaurant can have no Michelin stars. Looking at each of the ratings you’d have to conclude the san pelligrino rating is more focused on interesting experimental cooking. Where the Michelin guide prefers the tradition fine dining experience. I guess beauty is in the eye of the beholder. The restaurant’s setting is peaceful; surrounded by green hills with a semi rural feel. 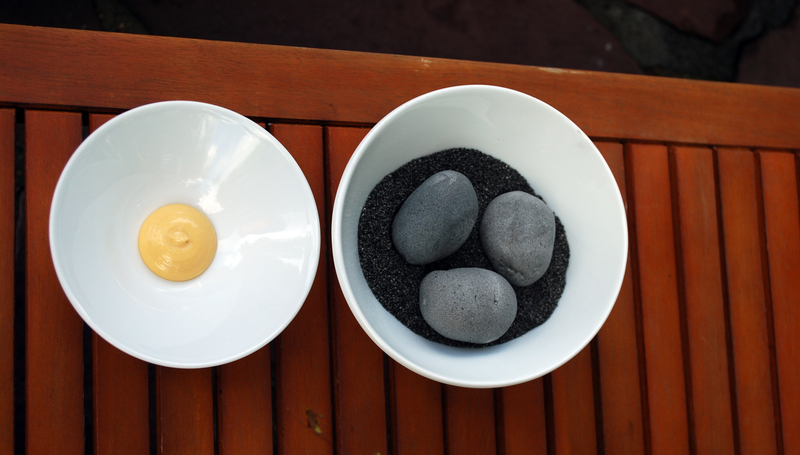 We are seated and served snacks in the courtyard which consisted of a mandarin juice with thyme and lime and mugartiz’s signature dish edible rocks (potatoes covered with ceramic). Both interesting with different flavours preparing the palette for what was to come. 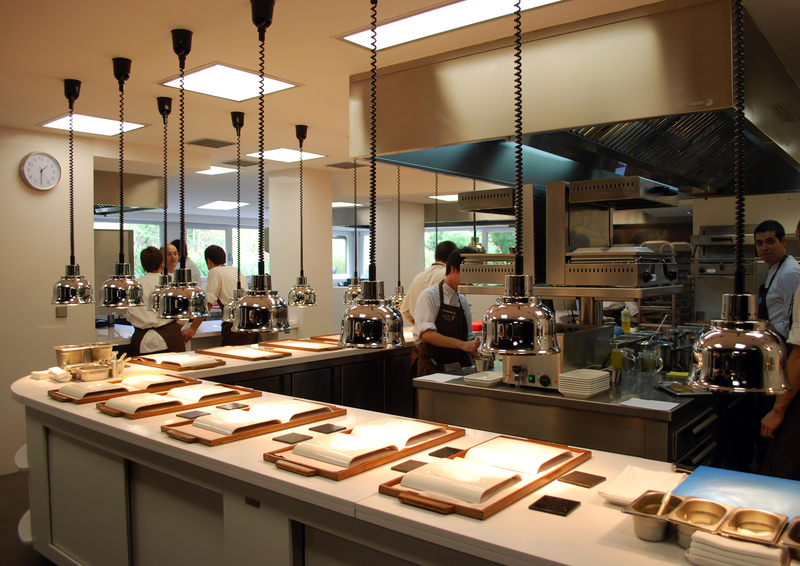 We are taken into the kitchen to meet the head chef who explained the 8 and 12 course menus. We are given the opportunity to select dishes from each menu if we wish. We decline the opportunity to select our own and ask the chef to select dishes for a 12 course menu specifically for us. The dinning area is modern and spacious with a minimalist avant garde feel as a result of creative table ornaments made from plates. As we sit down two small envelopes are put infront of each dinner. I’m not sure as to the meaning of what was written on and in each envelope but it created conversation and gave a greater sense of occasion. 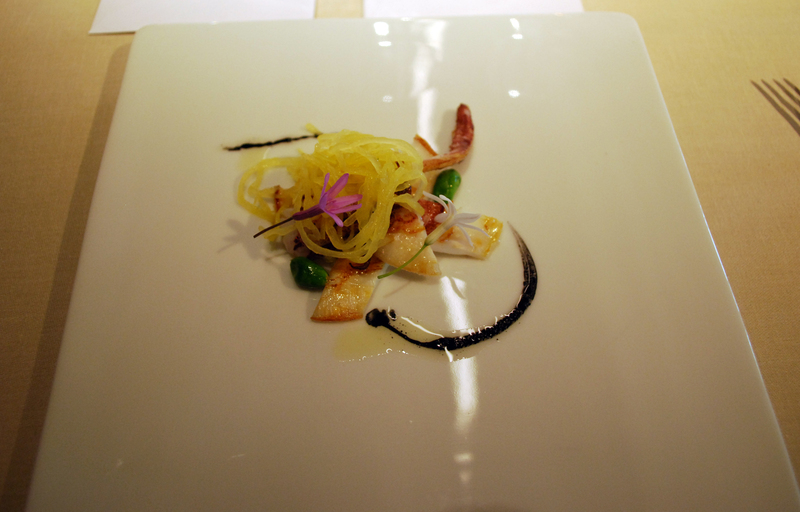 Squid and squid ink salad. 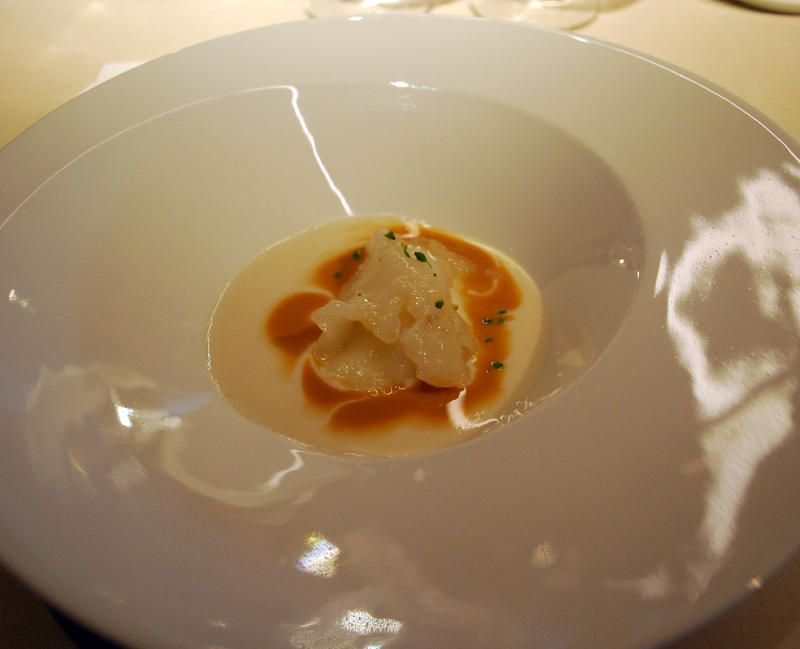 The perfect light, refreshing starter with good texture in the squid. Duck tongue salad. Unusual but very nice, the tongue is like pork crackling. Raw and roasted vegetables. This was the perfect mix of vegetable flavours. Cod in pine nut cream. The cod is very sticky and the sauce quite heavy with a rich flavour. Bread and crab stew. This dish is quite light, enjoyable flavour, maybe on the blander side however. Razor clam, black bean and cinnamon. 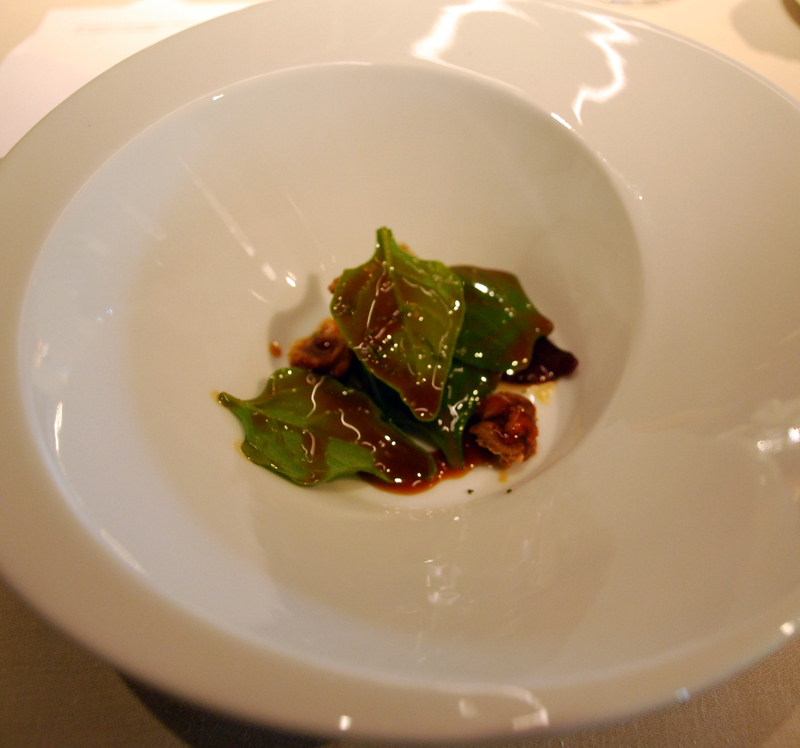 This dish looked fantastic although didn’t quite work, the clams were overpowering and the cinnamon hard to detect. 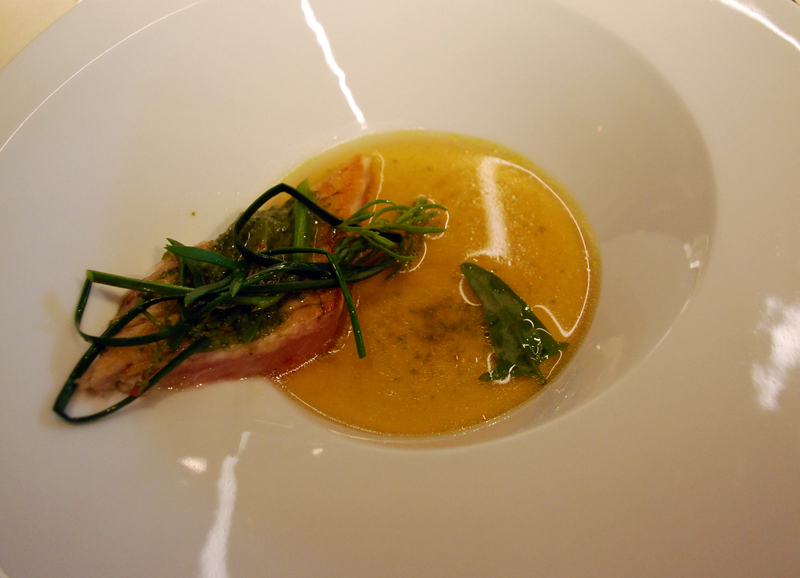 Bonito, chamomile and herb broth. Wonderful mix of flavours, this is one of my favourites. Duck loin and summer truffle. The Duck was delicious, however summer truffle is subtle in flavour and didn’t always come through to compliment the duck. 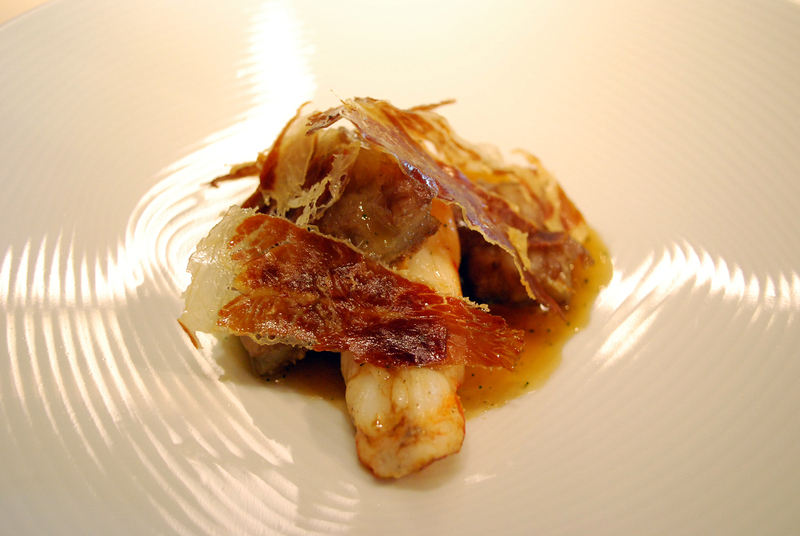 Iberian pork tails, langoustine tail, iberian jamon. 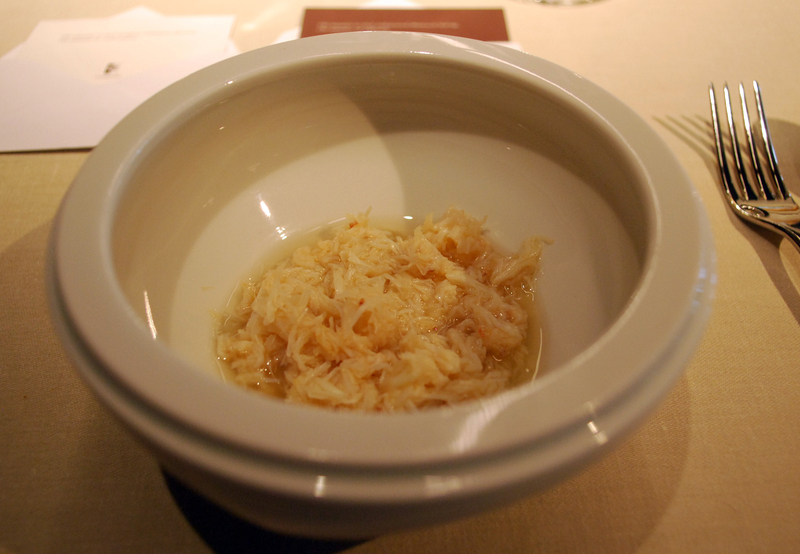 Rich flavours and differing textures in the tails and jamon worked well with the perfectly cooked langoustine. This dish was my favourite. White crystal, ganache, kaffir lime. Very interesting dessert. 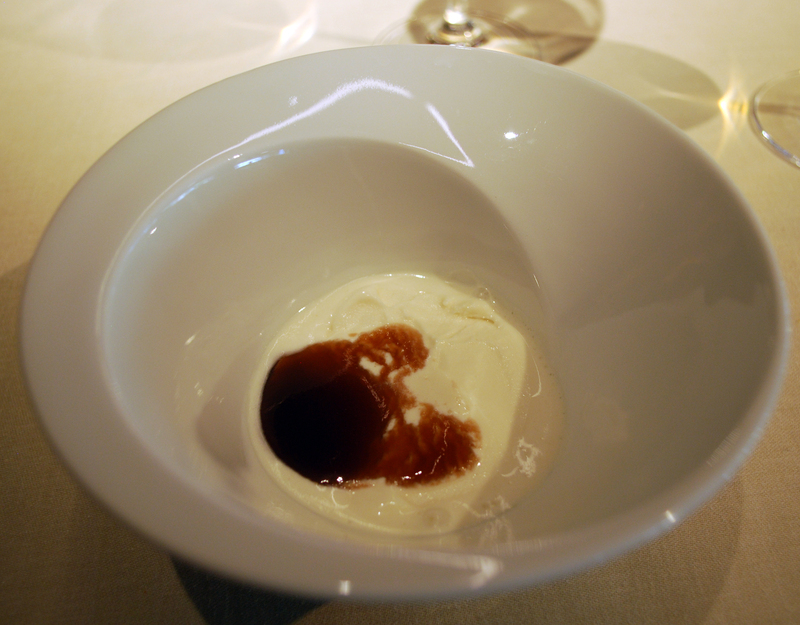 Chamomile ice cream, caco nectar, candied fruits. 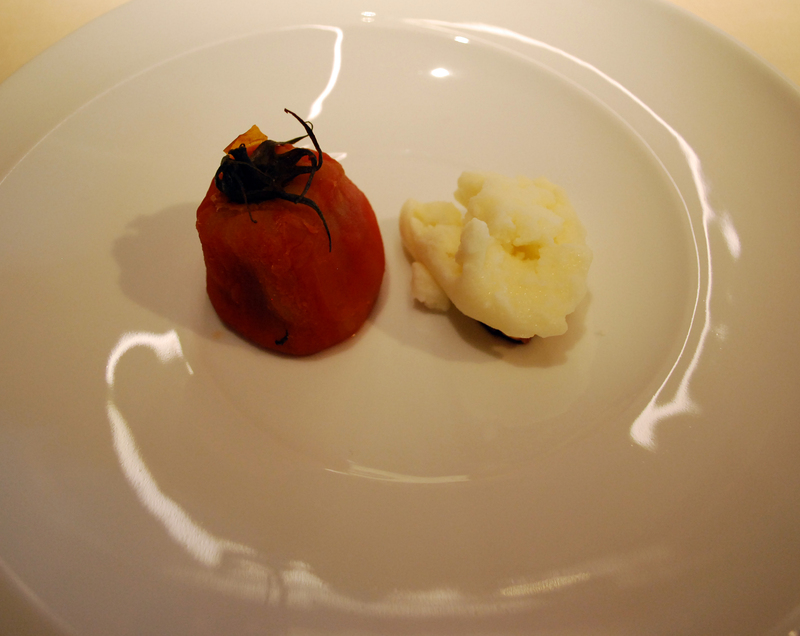 This dish was also a favourite. 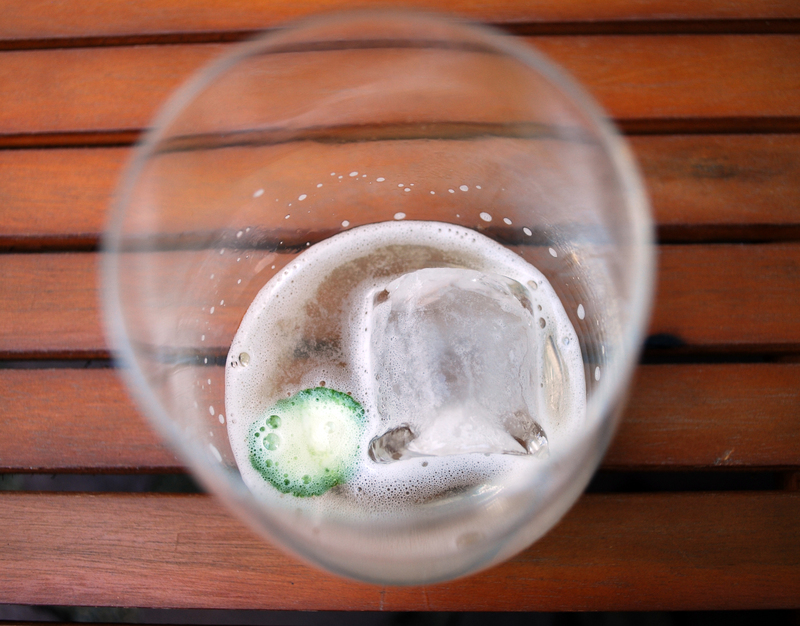 I’m a fan of chamomile and I felt it was an interesting mix with the caco which worked.